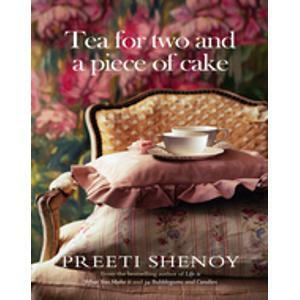 When I picked up Preeti Shenoy's book titled "Tea for two and a piece of cake," my first impression was that it is a nice book with a lovely cover. I looked forward to reading it. After reading the book, I couldn't get over the niggling feeling that the book has not been marketed well by Random House. They have not played up its strengths one bit. Frankly, I am disappointed with the publishers and decided I would write a book review so that at least those in my friends' circle would seriously consider buying this book. The story is simple but gripping about a girl called Nisha. The story is about romance, love, friendship and so much more. To be frank, I read it at one go because I couldn't put it down once it started. It is every Indian girl's dream and nightmare come true kind of book.A plump, ordinary girl gets the attention and interest of a handsome rich business tycoon who is so loving, considerate and perfect. They have a fairytale wedding, perfect dream home and romance. They have two lovely kids. And one fine day, the perfect husband calls her up and says the marriage is over. It doesnt immediately register in Nisha's mind. But reality strikes hard. Her near-perfect marriage is over and the blame is squarely put on her. He didn't want kids, but she did and the fact that her whole life and behavior was centered around the kids marked the beginning of the end of their marriage. A heartbroken Nisha tells her best friend Chetana about it and she realizes a bitter truth. Her best friend is actually happy that this happened to her and she is even gloating about her own happy married life without offering any suggestions on how Nisha can pick up the threads of her life. 1. Always be sure whether your spouse wants children as much as you do. There should be a clear dialogue of what to expect for both husband and wife. Later on, there should be no "I didn't want a kid" walk out scene. 2. Many wives rely on their husbands when it comes to financial matters, especially if they are comfortably settled. But it is important to know how much your monthly expenses are, how you can save money from household expenses by knowing exactly what costs how much and how further you can bring it down and what other options are available. 3. No matter how comfortably settled and married you are, it is important to find your areas of talent or strength, train yourself to be better at it and make it a source of income for yourself. You never know when that little bit of effort will take you a long, long way in life when you expect it. 4. If you see a friend in distress, the most important thing to do is to act immediately to offer an effective, humane solution rather than gloat about your near perfect decisions and perfect life. A friend in trouble needs your love, understanding and care, not your expert analysis of what you could think he/she could have done better. 5. Always identify those who value you and those who don't. Friends or anyone who don't value you as a person - walk away from them because they are looking for opportunities to make you feel low about yourself. Be happy to weed them out of your life. As for Nisha, her life was full of situations that she had to tackle on her own. But life handed her a fantastic surprise. It brought into her life a second chance for romance and this time, she knew it was right and just perfect for her and the kids. As an avid reader, I must say this: Preeti Shenoy is a writer to watch out for. She understands a contemporary Indian woman's world in a very simple, heart-warming way. Glad to know that all of you liked this book review. Hope to bring you reviews of other good books too, thanks a ton! That's a meaningful review Swapna..In a nutshell.Pretty and worth it.Having read the first book of Preety but I didn't had any idea of what this is like.Thank you. Thank you so much Augustine and Melange, I hope you read this book to enjoy it much more! Nicely written with spills of humour, suspense, thrill, romance and hope on each page. Hi, Swapna. It's interesting and meaningful review. Keep it up. . We are at Online Florist in Chennai offering wide variety of services includes flower delivery, cake delivery, gift delivery, and online sweet delivery Chennai.